Rally on 7-11-2017 along with consent form and original documents. Candidates will be selected based on written test, adaptability tests and physical tests for this Airman Jobs in IAF Maharashtra. Candidates must be physically fit for attend the physical tests. Interested candidates attend the IAF Jalgaon recruitment open rally at Moolji Jaitha College, Prabhat Colony, Jalgaon, Maharashtra – 425001. Candidates who are qualified intermediate or 10+2 with 50% of marks and born between the dates of 13 January 1998 and 27 June 2001, they are eligible to attend the recruitment rally of IAF Jalgaon. Candidates who are born in between the dates of 13-01-1998 and 27-06-2001 they eligible to apply for this IAF Airman jobs. Both dates also considered. Candidates must have qualified Intermediate or 10+2 with 50% marks in English and overall 50% marks they are eligible for IAF Airman open rally. For IAF Airman jobs candidates will be selected through written test, adaptability tests and physical tests. Written will be objective type only and consists of two paper. Candidates have to qualify the bot the papers. This test will be conducted for knowing candidates stability in various climate conditions of varied geographic terrain, weather and operational. PFT will be conducted for 1.6 kms running which have to complete in 7 minutes. 10 Pushups, 10 sit ups and 20 squats. Candidates who are having the above said qualifications they can attend the rally along with original documents and consent form on 07-11-2017 @Moolji Jaitha College, Prabhat Colony, Jalgaon, Maharashtra – 425001. Note: Don’t Pay Anything to Fraudsters who are tying to mislead you while saying “Pay and get job”. 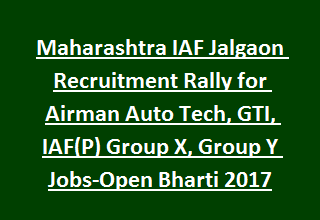 Download Notification here for IAF Airman Jobs Recruitment Rally in Maharashtra Jalgaon.